To belong is a core need of the human heart. Jesus addressed this need in the people he encountered wherever he went. 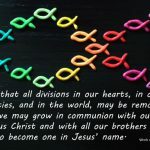 In Jesus’ company, people of goodwill found if not a home, then a place to belong, a place to be authentically themselves. This is not to say that being with Jesus was a soft option – far from it. Following Jesus carried with it the challenges that Jesus himself faced. The people who walked with Jesus were challenged to give, to serve, to bring about the Kingdom in every aspect of their lives. The fruit of this belonging is service. Stewardship is like that. The need to belong comes before the commitment to serve. Once we have a place to stand, a place that speaks to our hearts of the goodness of people (and therefore the goodness of God), we are liberated and empowered to serve as we have been served. Our service is a response to the gratitude that fills our hearts for the gift that is our life. Most Catholic schools have their origin in the parish where they are located. They were built by the people of the area some 40, 50, even 100 years ago, in response to the needs of local children. They are both a fruit and a symbol of the gratitude for and the energy of faith of the parishioners. 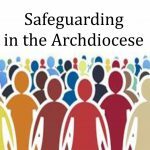 It is vital that Catholic schools and parishes work together to develop a deep sense of belonging and unity. Catholic primary schools are often the first point of parish contact for young families when they enrol their first child. How these families are welcomed is vital to their experience of belonging to church – first to the school community but also to the wider parish community. My experience is that no one can ever be ‘over welcomed’! People who feel welcome have a more immediate sense of belonging. They develop a vested interest in the community, which quickly becomes their community. They belong because they can be authentically themselves. They are accepted for the gift they are and from this springs a natural desire to respond, to help out and to serve. For this to happen, community members need opportunities to use their gifts. This is the leaders’ task. When school and parish leaders work together with a common vision, a greater sense of community will result. There are many different ways people can use their gifts – it may take a creative team to coordinate but the result will be enhanced community service. 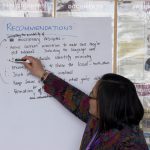 Stewardship can and will blossom where people recognise and value the giftedness of one another, provide opportunities and support for people to serve and celebrate together. This is what Jesus did and Jesus still calls us to build the Kingdom as a community of love and of service. Zita Smith is principal at St Theresa’s School, Plimmerton. 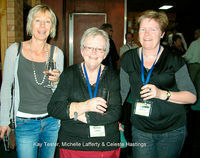 Image: Kay Tester, Michele Lafferty and Celeste Hastings at a conference on stewardship in Brisbane in August. Kay and Celeste are principals at St Brigid’s, Johnsonville, and HOly Cross, Miramar. Michele is manager of Catholic Schools.